It’s Saturday morning in the adult baby nursery. The light coming through the windows shows it’s a sunny morning, but it isn’t too bright – the pale blue curtains keep the room comfortably darkened. The night light doesn’t seem as strong in the day, but it still accentuates the bars of the crib and the change table. Saturday mornings can be special times for the adult baby. Not every diaper-loving boy will need a nursery nor want one, but for those who do it’s a very special room for the baby boy. For those who have their very own room waking up in a crib can be like waking up from one dream into another. The adult baby boy lies in his crib and feels the fuzzy reminder of a dream, one that he can’t quite remember, but it leaves a warm feeling, like a dream of hugging or safe small spaces. 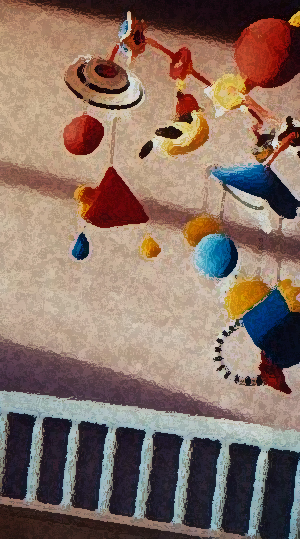 As he wakens he takes in his surroundings: the light first and then floating forms like the mobile above him with its pastel cloud shapes and cartoon airplanes and moon and star shapes. He stares for a bit at the mobile, not really focusing, and then stirs a little as he wakes up a little more and realizes he doesn’t have his pacifier. He keeps staring at the mobile while his hands search around his chest for the paci pinned to his sleeper and puts it in his mouth. As he turns his head slightly the bars of the crib come into focus. Seeing the safe enclosing crib sides he instinctively pull his legs up towards his tummy a little and then stretches them as his hand reaches out to touch one of the bars. The feeling of the crib sides makes him give a little gurgle, as if some tender feeling just bubbled up from his tummy. As the little one wakes up more he starts hearing sounds. There was the crinkle of the plastic sheet beneath him. The sound of the soft flannel of his sleeper as his legs brush against each other. And in the distance a sound that suddenly gives him great comfort – the sound of daddy in the kitchen. He wonders a little if daddy is getting him a bottle or something special for breakfast. He looks up along the sides of the crib past the different toys and games attached to the crib sides and notices the baby video monitor attached to the top end of the crib. He gets a rush of contentment knowing that daddy can watch over him and that maybe even now he’s looking in on the video baby monitor from the other room. As he flops to his other side to find his teddy bear, the diaper gives a rustle and he feels a squishiness under his bum. He’s suddenly aware his diaper is wet and still a little warm. He lies for a minute in a sudden floating feeling. He can’t find words for the feelings. He’s vaguely aware that he doesn’t remember using his diaper. Usually he remembers. He feels a little confused – trying to remember wetting himself switches between the feelings of the diaper itself and how safe it feels, how warm, and how he doesn’t feel uncomfortable leaks like when he used to diaper himself. For a flicker of time, he wonders if he can’t help wetting, otherwise why would his diaper be wet and not remember using it. He lies for a moment, his mind switching between the feeling of the wet diaper and knowing he soaked himself without meaning to. A sound from the kitchen as he hears daddy open the fridge shakes him from this feeling and sends him instead into a rush of feeling babyish and cuddly. He finds his teddy bear and brings it to his chest. He lies there hugging his plushy, wet but not uncomfortable, suckling happily on his paci, feeling safe and secure and knowing that daddy will come to love him and care for him and that the world is warm. what a perfect description of waking up in a crib. i’m sure you can imagine the longing this post stirs in us who want to wake up one morning in exactly that way. as i read it a little whimper escaped my lips, almost a babyish gurgle…a natural reflex when thinking about these special moments. HOW DO I TURN MY FULL SIZE BED INTO MY VERY OWN CRIB? I love waking up in my crib the sight of my toy’s on the side my bear Snuggles in my arms and my paci on my sleeper, I like to lay there and take in the heavenly bliss of floating on a cloud and love the smell of breakfast that daddy is cooking in the kitchen. I know full well that soon daddy will be in to get me give me my morning hug and peck on the forehead before he lowers the side rail on my crib to let me out. The feel of daddy taking my hand and walking me to the kitchen and helping me up into my high chair and the sound of the tray being locked in place so i cant fall out. God i love my Daddy for he is the GREATEST Daddy a baby boy could ask for. This is one special baby!! What a lucky fellow. Very nice. All the stories here are so soft and gentle. It’s what I’m looking for. Don’t Remember this one but it was a nice one to read. I like seeing new things. Sleeping in a crib every night some of these feelings are similar to what I feel when I wake up or even go to sleep in a crib including the teddies and my Pilly that I snuggle at night all night long. I always seem to keep my binkie in my mouth most of the time and when it falls out I always seem to look for it.